Have you ever wondered why it’s so hard to convince someone their beliefs are wrong? It’s even harder to convert them to your way of thinking. They tune you out when you talk about things that aren’t in line with what they think. As soon as you talk about what they know to be true they’re all ears. Their pupils dilate, their posture changes, and they give you their undivided attention. It’s the confirmation bias at work. The confirmation bias is the tendency to selectively search for, recall, interpret, and consider information that confirms your beliefs. We latch onto information in line with what we already believe. For example, someone putting together a research paper showing the effects of oil on aquatic environments will search for evidence that bolsters their point of view and largely ignore any other perspective. A hiring manager that thinks a candidate is a good fit will pay more attention to information that supports their conclusion. A coach that thinks people over six feet are better players will give taller people preference when choosing the members of his team. Quizzes are uniquely positioned to give you the advantages of confirmation biases. When you understand your audience, your outcomes will reflect what they already believe about themselves. We can go on and on about it, but it’s safe to say that the confirmation bias can open huge opportunities in your business. All you have to do is tap into what your customers and clients already consider a truth while confirming they’re on the right path. In the 1960’s, Peter Wason performed a simple experiment with a number of volunteers. The volunteers were asked to determine a pattern that applied to a series of three numbers. The example given to the subjects was “2-4-6” and they were allowed to construct their own series of numbers to test their hypothesis. When they constructed their own series of three numbers, Wason would tell them whether it conformed to the rule or not. The actual rule was any ascending series, participants had trouble identifying it and would create rules that were far more specific. 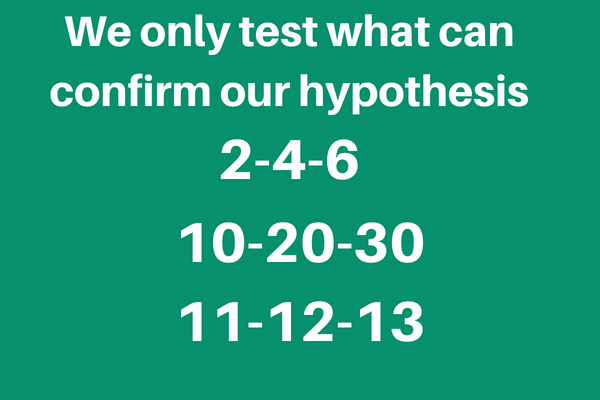 What was most interesting was that participants only tested rules that would confirm their hypothesis. For example, if they thought the rule was “increases by ten” they would only test numbers that confirmed it EG 10-20-30 and ignore those that violated it EG 10-11-12. Wason brought this cognitive bias to light and we’ve been using it ever since. I’ve written on the power of thank you pages to unlock more engagement and revenue. What happens after they optin or buy from you? Are you using the thank you page to confirm their initial thoughts about why they joined in the first place? Derek Halpern of Social Triggers throws in some confirmation bias when you sign up for a free Ebook to get your first 5,000 subscribers. He confirms your initial thoughts that he’s a genuine person and asks you to start participating in the community that’ll help you grow your business. If you were wondering if it was too good to be true, he removes that doubt immediately. From that point on, anyone who subscribes will only look for more information to back up their initial impression. RoboForm goes straight for the jugular with their thank you page after sign up. After signing up, they let you know immediately that you’re an amazing person. Not only that, they ask you to show off this validation to your friends by asking them to sign up. The internal dialogue goes something like this. The person who signs up thinks they made a good decision. RoboForm confirms this by telling them they’re awesome. With this newfound validation, the person would be more likely to spread the information to their social circle. RoboForm gets more users, you get more validation to confirm your initial awesomeness. When you’re using Mailchimp, you’ll eventually send out a few newsletters. I’ll never forget that first high five the monkey — Frederick von Chimpenheimer IV — gave me when I sent my first one. This positive reinforcement confirms what I already know, I’ve completed a major milestone, and gives me kudos for doing so. The same process works during a checkout process. Sprinkling in “well done” and “you’re almost there” messages will help increase conversions. Another way to use the confirmation bias to encourage the completion of a process is to use a progress bar. When you sign up for services like Facebook, Dropbox, or anything that requires a little more information, a progress bar is used to show how much you’ve done. We use a variation of this inside of our app. If you’re at the beginning of the process, usually, your own momentum is enough to keep you going. Then, something happens and you have to log out or start doing something else. The progress bar shows you how much effort you’ve already put in and subtly reminds you that there’s just a little bit more to go. 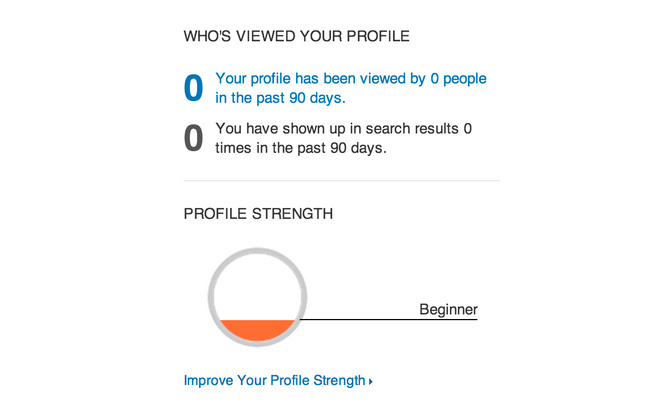 LinkedIn does this well with their profile strength indicator. 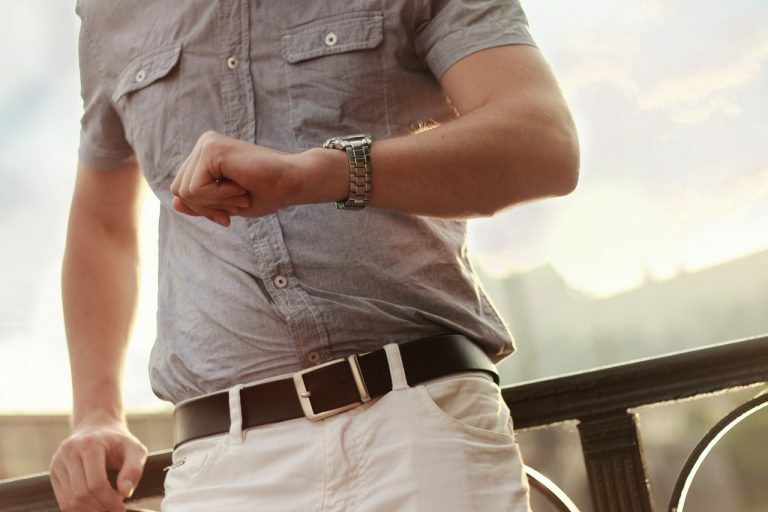 Before you take the time to complete your profile, you probably don’t have much going for you on the platform. It’s likely you don’t have many views or connections. You’re a beginner. After filling out some more information, you’ll be an all-star ready to take on the world of corporate espionage :). The all-star rating confirms what you already know, you’re amazing. 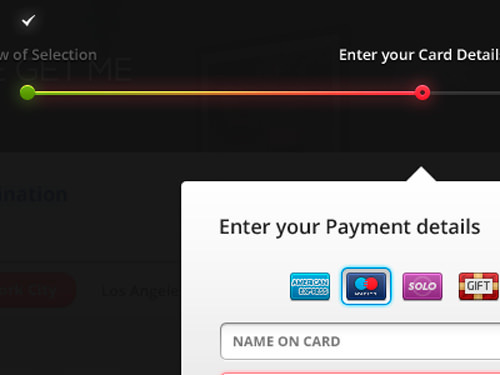 It’s not limited to just social profiles, you can easily use it during the checkout process like the following example. It lets you know that you’re almost there and for you to have come this far, there must be something worthwhile in the product you’re purchasing. Use it to remind them of how much they’ve already committed thus confirming their love of what you’re offering. Don’t stop there, brainstorm different ways you can use the confirmation bias to build stronger relationships with your tribe. Let me know what you think about the confirmation bias in the comments and don’t forget to share.